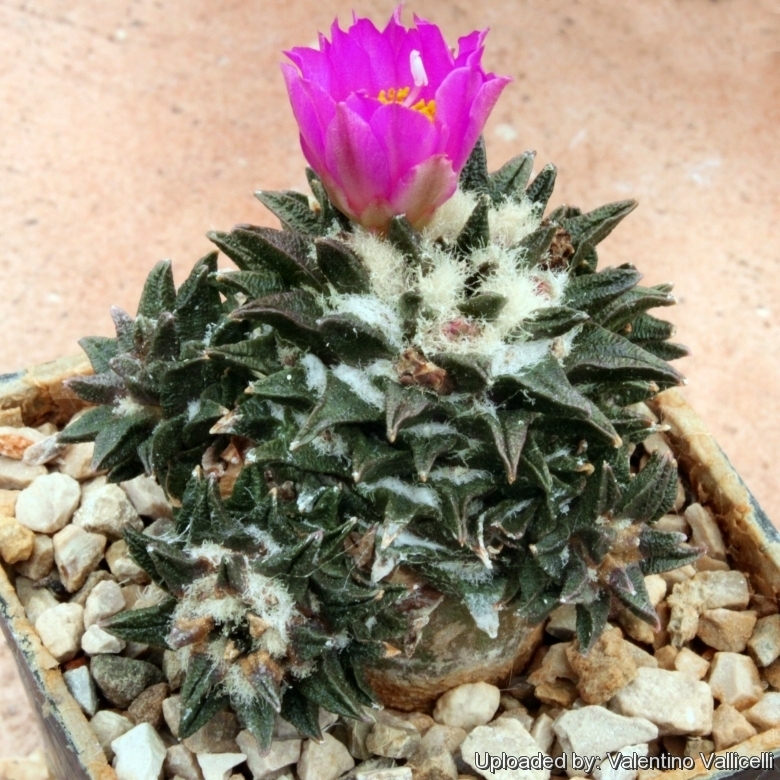 Ariocarpus scaphirostris var. swobodae Halda, Horáček & Panar. 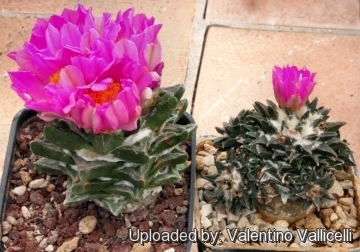 Description: Ariocarpus scaphirostris cv. 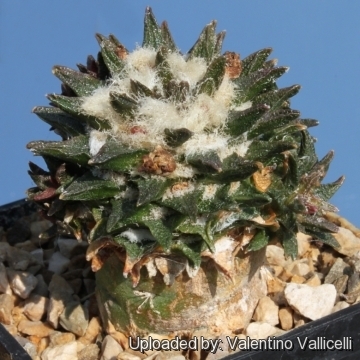 Dwarf Form differs from the standard Ariocarpus scaphirostris only for its reduced size and minuscule triangular tubercles, all the other characteristics clearly show that they are conspecific. Habit: Ariocarpus scapharostris is a slow-growing grey-green, geophytic cactus rising barely above ground level. Stem: Smaller solitary, subglobose or globose, more or less rounded on top, 3-5 cm in diameter and 2-4 cm tall. Tubercles: Several, divergent, erect spineless, bluntly pointed at the apices, flat­tened and smooth adaxially, fissured, slightly incurved, 1-1,5 cm long, less than 5 mm broad, about twice as long as wide, grey wool between the tubercles. Roots: Thick underground carrot-like root. Flowers: Diurnal, self-fertile, bright dark purple, up to 3 cm. Blooming season: Flowers in the Autumn, it flowers and fruits profusely. Fruit: Greenish, 9-15 mm long 4-8 mm in diameter. 7) E. F. Anderson and W. A. Fitz Maurice "Ariocarpus revisited." Haseltonia 5: 1-20. 1997). 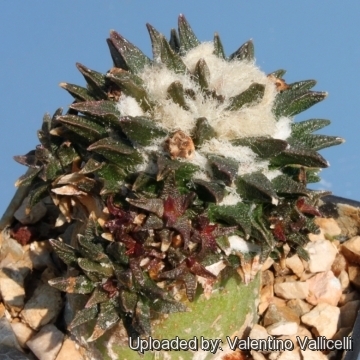 Cultivation and Propagation: Ariocarpus scaphirostris cv. Dwarf Form is not too difficult in a greenhouse, although grows very slowly. It is often seen as a grafted plant but can grow on its own roots too. Dwarfed growth: Unlike 'monstrose' varieties of plants, where the variation from normal growth is due to genetic mutation, dwarfed growth can occur on normal plants, but generally the causes are unknown. A dwarf plant looks like a normal plant, but smaller in size.